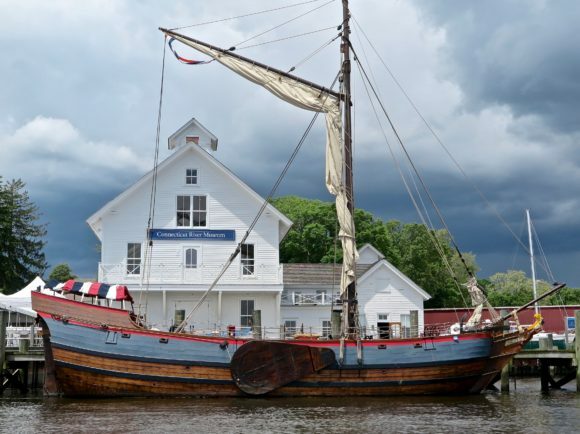 Spend an evening enjoying historic Dutch cultural traditions at the Connecticut River Museum and take a cruise aboard Onrust. Photo by Pim Van Hemmen. ESSEX — On Saturday, Sept. 9, from 5 to 8 p.m., experience The Netherlands as the Connecticut River Museum hosts a night to support The Onrust Project. Enjoy Dutch culture with samples of traditional food and drinks. There will also be classic Dutch tavern games, music, and a cannon demonstration – all from the Museum’s beautiful north deck overlooking the Connecticut River. 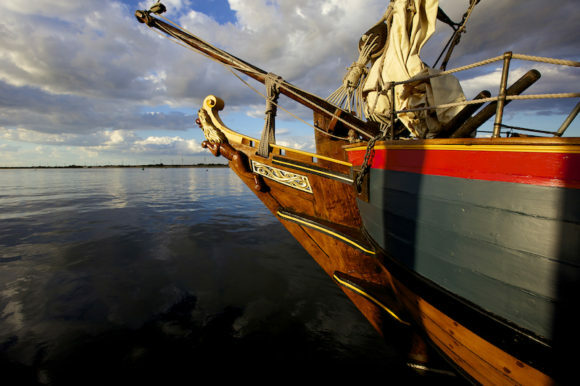 The Onrust is a reproduction of the famed Captain Adriaen Block’s 1614 era vessel that was the first European vessel to chart and explore Long Island Sound, parts of Rhode Island, and the Connecticut River. Block’s accomplishments ushered in great changes that would forever alter life along the Connecticut River, help lead to the fur trade, and the eventual founding of New Netherlands and what would become Hartford. A Dutch drink tasting will take place with Mark Griswold and Stephen Gencarella. Griswold and Gencarella are the talent behind the popular weekly radio show “Fermented,” which airs every Thursday night on iCRV Radio. The two will share some of the history and interesting characteristics of traditional Dutch drinks. One such beverage that will be sampled is genever – a spirit that is the forerunner of gin and has been popular since the 1500s. Catering by Selene, enjoyed by the Museum for their excellence and creativity in recreating historic recipes, will provide several traditional Dutch foods for people to sample. This includes stamppot which is the Dutch name for any puree made of vegetables and often served with sausage. There will also be bitterballen (tiny meatballs) and the delectable stroopwafel. Also taking place this night will be a cannon demonstration by Dan Walls. Walls will not only shoot off one of Onrust’s reproduction cannons, but will share a little history on the evolution of such weaponry. There will also be live music and some traditional tavern games for people to play. The historic replica vessel Onrust is docked at the Connecticut River Museum through mid October for public cruises and programs. Photo by Judy Preston. A Supporting level ticket will include a 45-minute cruise aboard the Onrust, a special mixed drink and a conversation with Greta Wagle, Director of The Onrust Project. The Standard ticket includes the drink and food tasting, music, games, and cannon demonstration and is $30 for members/$35 for non-members. The Supporting ticket includes the above as well as the special cruise and is $50 for members/$55 for non-members (When reserving you will need to select a cruise time of 5:15 or 6:30 p.m.) Additional beverages will be available at a cash bar. Participants must be 21 years of age or older and show ID. To buy a ticket, visit the Connecticut River Museum’s website at ctrivermuseum.org or call 860-767-8269. Funds will go towards supporting the educational mission of The Onrust Project, a nonprofit floating museum that provides the public with a living history experience of 17th century life and maritime exploration. The Connecticut River Museum is located on the Essex waterfront at 67 Main Street in Essex and is open daily from 10 am to 5 pm. The Museum, located in the historic Steamboat Dock building, offers exhibits and programs about the history and environment of the Connecticut River. For a full listing of Museum programs, visit www.ctrivermuseum.org or call 860-767-8269.